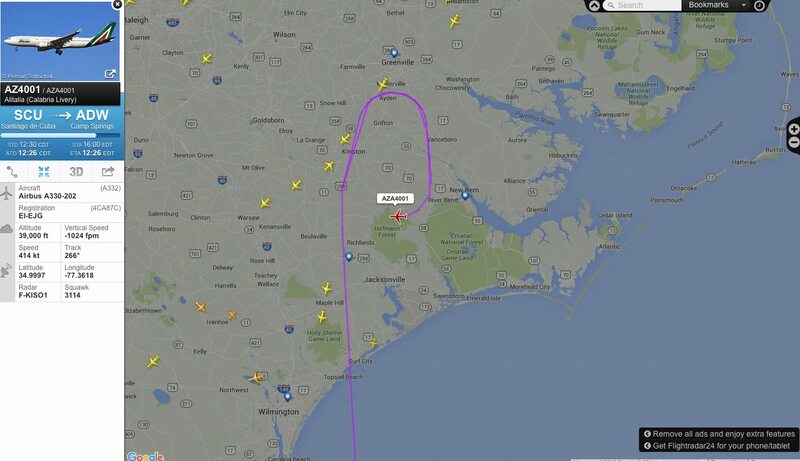 It was such an exciting moment, to realize that the Pope was over American Airspace! 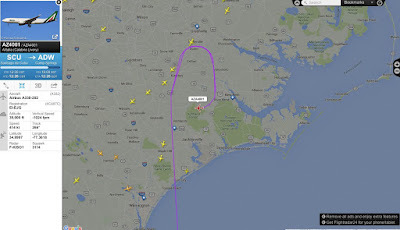 The plane did several 360s over eastern North Carolina, just south of Greenville. 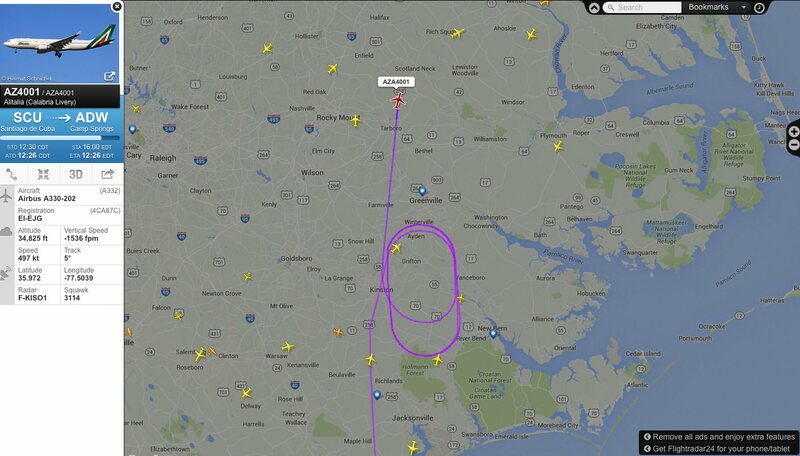 Presumably, it made good time from Santiago de Cuba, and was waiting for the officially published landing time of 1600. 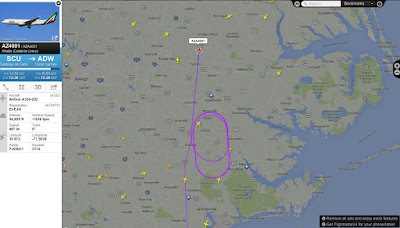 I had a window open with the air traffic control feed for Potomac Approach via LiveATC. Around 345 pm I heard, "Alitalia four zero zero one heavy, cleared runway one left approach," and a confirmation from the pilots! 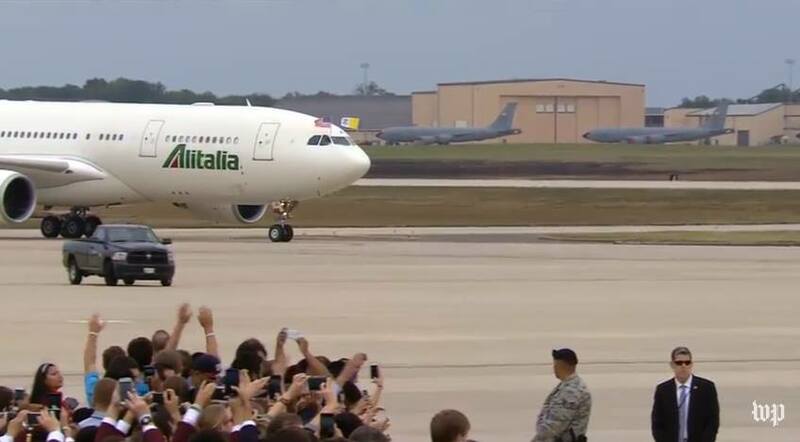 And then, "Alitalia four zero zero one heavy, contact Andrews tower!" A quick switch to the live feed from the Washington Post on YouTube (the source of all the following screenshots), after AZ4001 landed at Andrews Air Force Base. The first glimpse of the Holy Father on U.S. soil, to raucous cheers from the gathered crowds! An uncommon sight: POTUS hobnobbing with the U.S. Bishops. 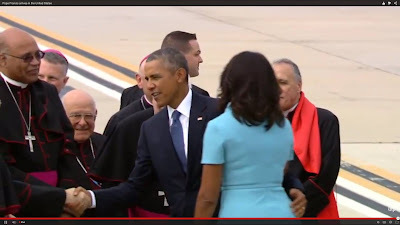 To the right of Michelle Obama is Cardinal Di Nardo of Houston. To the right of POTUS, looking rather short, Bishop Loverde of Arlington; in front of him, Bishop Holley of Washington DC. The handshake is with Archbishop Lori of Baltimore. It was an exciting few hours, and it was fun sharing it on Twitter and Facebook, and chatting on WhatsApp with my friend Harry (with the State Dept. 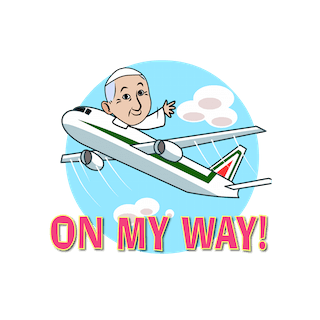 at our Embassy in New Delhi), a fellow devout Catholic and aviation buff, who was up late being as nerdy as ever. PETER IS HERE! 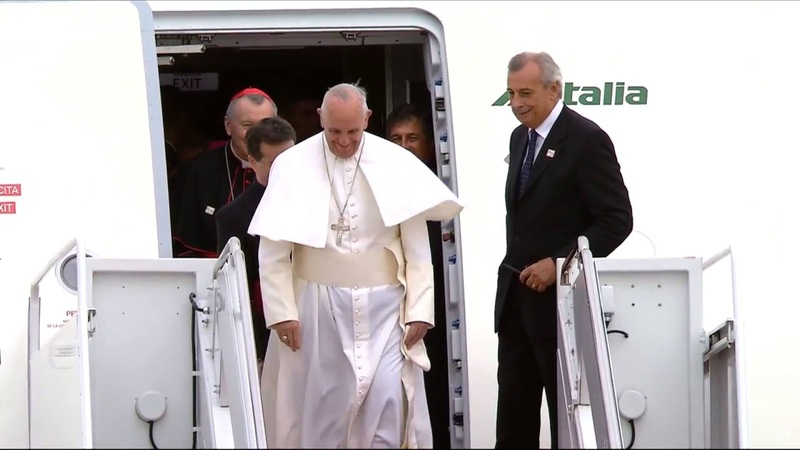 Welcome Holy Father! 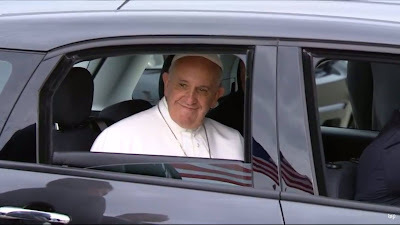 Please pray for a safe visit, and that the Lord shower many graces on our country as we pay close attention to the Vicar of Christ's words and actions while he is with us. I’m sure that I haven't said anything more than what’s written in the social doctrine of the Church. On another flight, a colleague asked me if I had reached out a hand to the popular movements and asked me, “But is the Church going to follow you?” I told him, “I’m the one following the Church.” And in this it seems that I’m not wrong. I believe that I never said a thing that wasn’t the social doctrine of the Church. Things can be explained, possibly an explanation gave an impression of being a little “to the left”, but it would be an error of explanation. No, my doctrine on this, in Laudato si', on economic imperialism, all of this, is the social doctrine of the Church. And it if necessary, I’ll recite the creed. I am available to do that, eh.